Successfully Added CMX Phablo 6 Inch Android Smartphone - Quad Core CPU, Android 5.1, Smart Wake, Gesture Control, Dual SIM, Hot Knot (White) to your Shopping Cart. 6 Inch Android Smartphone Brings you more for less. Looking for a 6 inch phone but not willing to pay for an iPhone 6 or Smasung edge? If so the 6 inch CMX Phablo could be for you. This unbelievably cheap Phablet is one of the best value phone available, with its metallic frame and stylish looks is undeniably beautiful and at just 8 mm thick it’s easy to hold. This large screen phablet has a huge 6 inch display that will delight and thrill with its outstanding performance and come bursting to life with vivid colors brining you immense viewing pleasure. With a quad core MTK6580 chip set that runs at 1.3 GHz, is backed up by 1GB or RAM and a Mali 400MP graphics processor you can enjoy a faultless experience whether you’re gaming, watching movies or multitasking, great for the frequent travelers and commuters. Android 5.1 brings you the best features of this outstanding OS so you can enjoy superior optimization and user controls while taking advantage of the improved multitasking and energy saving functions. Smart wake makes accessing all your favorite apps and performing daily tasks much easier. To open a desired app just draw the corresponding character on the lock screen, A ‘w’ will instantly take you to the web browser and an ‘M’ open the music player. Alternatively edit the settings for your preferred choice of apps. You can also take advantage of gesture controls with on the CMX Phablo, just waving you hand above the phone lets you switch pages in the main menu, scroll through photos or change music tracks, so even with a large screen you can still use the phone with one hand. 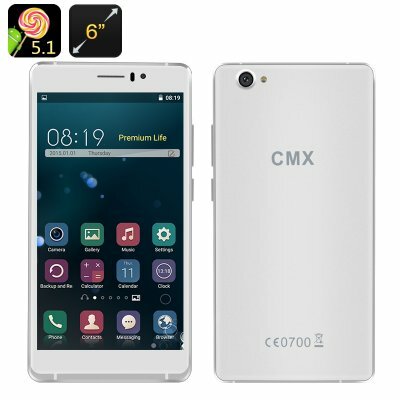 The CMX Phablo also benefits from front and rear cameras which let you capture beautiful selfies as well as the perfect holiday snapshots so you can leave your point and click behind and embrace this benefits of a Phablet, you will even be able to review your photos on that 6 inch display to make sure you captured the perfect memories.